Agora Arts Summer Circus Camps 2018 – Learn Aerial Arts performance in a fun environment this summer in Ferndale at Agora Arts! Dance on air, LITERALLY, with the art form combination of gymnastics, dance, and the circus arts. 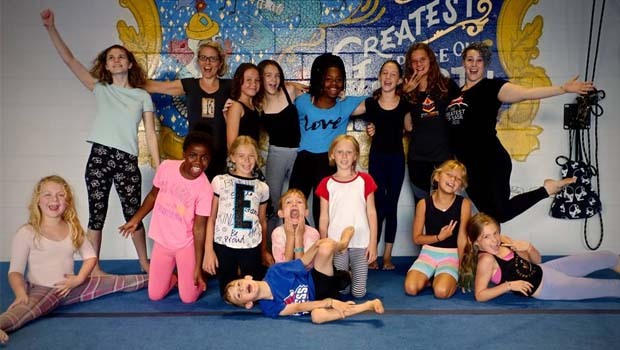 If your child is interested in Cirque du Soleil types of performances, or simply wants to expand on their gymnastics or dance background, Agora Arts is the summer camp experience for them. At the Agora summer camp your children will experience the benefits of practicing circus disciplines. What sets circus apart from other sport activities is that circus is not competitive and has an artistic, creative aspect. In addition to improving their spatial orientation, fine and gross motor skills, balance, strength and flexibility they also develop life skills such as teamwork, focus, trust and responsibility. Agora’s camp is a fantastic physical conditioning which is useful for dancers, gymnastics and sport enthusiastic of all kinds. Campers will start with warm-ups and fun games to prepare their bodies for all the twisting, jumping, and bending they will do throughout the day. After that, young acrobats are split into mixed groups of age and skill levels to work on various circus disciplines. Their supportive coaches will assist each camper with working toward their individual goals in a fun and friendly team setting. Each day, campers will be working on aerial acrobatics, tumbling, acro balance, hula hoop, dance, yoga and more. All levels welcome, no previous experience required! Camps are for kids ages 7-12 years old and run from 10a-1:30p with extended care hours available from 8:30a-4p. Camps are $250 or $450 for the day camp with extended hours.